It’s March already, which means that the colorful festivities of Easter will be here in no time! Easter holidays have a lot to do with family, Christ and eggs; but eggs mainly because of the fun-filled egg scavenger hunts that adults and children enjoy. 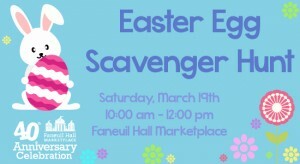 Keeping to the modern tradition of Easter Sunday and the very temporal Easter Bunny, if you are looking for the most exuberant hunt in Boston then join the Easter egg scavenger hunt at Faneuil Hall Marketplace. 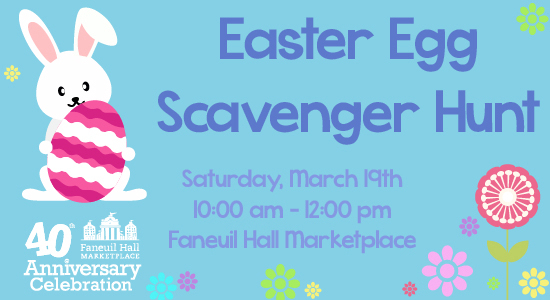 For the past three years, Faneuil Hall has been hosting lively scavenger hunt events near Easter day to bring together a youthful spirit of competition and adventure for the people of Boston. Packed with clues to solve, equipped with baskets to safe keep your findings and topped off with a prize to keep you going. The Boston Easter egg scavenger hunt is definitely going to be worth your time and a memorable experience for all age groups (particularly children and ones with little ones). It is completely free, so do bring all of your family and friends. There will be 3 winners and the 3 winners will receive a Family- 4- Pack tickets to Sesame Street Live “Lets Dance” which will surely be another rejoicing experience. You are guaranteed to have a gala of a time. So join in the fun and visit the events website for more information and details on the Easter egg scavenger hunt!